Contemporary dialogue about patient-centred care, however, seems compromised by an implicit paradigm, which suggests that healthcare service is a product manufactured by healthcare systems for use by healthcare consumers. This product paradigm may confound efforts to put patients and professionals in right relationship. Healthcare service is better conceived as a service. Services, unlike manufactured goods, are always coproduced by service professionals and service users. Even in the most traditional model of medical practice—patient comes to clinician for help, clinician listens to and examines the patient, clinician formulates a plan and instructs the patient, patient follows (or does not follow) suggestions—health outcomes (good and bad) are coproduced. Good outcomes, most recognise, are more likely if the patient can and does seek and receive help in a timely way, if the clinician and patient communicate effectively, develop a shared understanding of the problem and generate a mutually acceptable evaluation and management plan. The degree to which patients and professionals each hold agency for these coproduced outcomes varies widely, but the observation that health outcomes are a consequence of the dispositions, capacities and behaviours of both parties seems self-evident. Deceptively obvious, the concept has profound implications for improving healthcare quality, safety and value. In 1980, Alvin Toffler described a new generation of increasingly sophisticated and technologically enabled consumers as ‘prosumers’ capable of linking previously separated functions of production and consumption in ways that maximise consumer convenience and minimise producer cost.12 Familiar examples include at-home pregnancy tests, cake mixes, self-service gas stations and automated bank tellers. The ongoing digital revolution in the decades since Toffler wrote continues to blur the boundary between producer and consumer in almost relentless innovation. Richard Normann further developed service coproduction.13 The word consume, he noted, has two Latin roots—‘to destroy or use up’ and ‘to complete or perfect’. Using the second meaning, consumers are consummators that can and do create value at every stage in business during research and development, design, production and delivery, monitoring and evaluating quality. He described a “service logic” that replaces the “oversimplified view that producers satisfy needs and desires of customers” with the “more complex view that they together form a value-creating system” (Norman,13 p. 98). Business offerings, using this logic, are not outputs of the business, but rather inputs for consumers’ processes of value creation. He distinguished a ‘relieving’ service logic and an ‘enabling’ service logic. In ‘relieving’ work, a professional creates value by doing something for the consumer that the professional is better equipped to do. In ‘enabling’ work, a professional creates value by expanding the scope of what a consumer can do. Building on the distinctions between the production of goods and the production of services articulated above, Vargo and Lusch describe the differences between a ‘goods-dominant logic’ in public administration management theory and a ‘service-dominant logic’.28 Osborne summarises three key distinguishing features of services that inform this need for a service-dominant logic in management theory: (1) a product is invariably concrete, while a service is an intangible process; (2) unlike goods, services are produced and consumed simultaneously and (3) in services, users are obligate coproducers of service outcomes.29 Radnor et al17 note that public management theory, despite its service core, consistently draws upon generic management theory derived from the goods-dominant logic of manufacturing. We believe her insight applies to healthcare services and healthcare service improvement as well, where improvement methodologies and frameworks (such as Lean and Six Sigma) developed in manufacturing often dominate. Though a comprehensive review is beyond the scope of this paper, governments have increasingly called for more explicit attention to facilitating partnership between professionals and beneficiaries in coproducing public services.17–19 ,23–25 Loeffler et al30 note several motives for this movement. More effective partnership in these coproduced services, they posit, might improve public services by (1) employing the expertise of service users and their networks; (2) enabling more differentiated services and more choice for service users; (3) increasing responsiveness to dynamic user need and (4) reducing waste and cost. We suspect that we might further the same aims by advancing a more explicit commitment to facilitating effective coproduction in healthcare services. Several have previously suggested bridges between healthcare service and the construct of coproduction.31–35 In describing the Scottish commitment to advancing effective coproduction in social and healthcare service, Loeffler et al30 note that the construct is far-reaching and includes potential partnership between health professionals and patients (or people seeking help to maximise their health and wellbeing) at many levels: (1) co-commissioning of services, which includes coplanning of health and social policy, coprioritisation of services and cofinancing of services; (2) codesign of services; (3) codelivery of services, which includes comanaging and coperforming services and (4) coassessment, which includes comonitoring and coevaluation of services. They describe the Scottish Co-production Network that provides a forum for shared learning about the practice of coproduction in social and healthcare services. 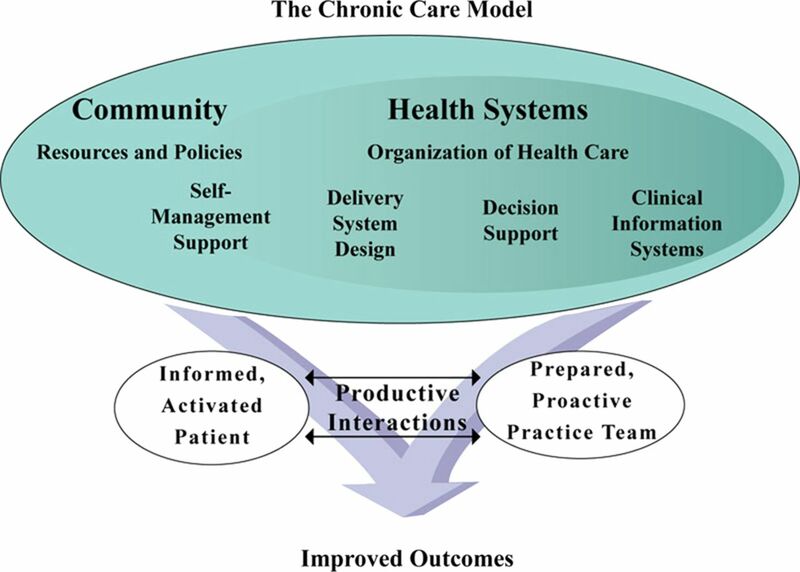 Chronic Care Model, developed by The MacColl Institute, © ACP-ASIM Journals and Books, reprinted with permission from ACP-ASIM Journals and Books. First published in: Wagner EH. Chronic disease management: what will it take to improve care for chronic illness? Eff Clin Pract 1998;1:2–4. 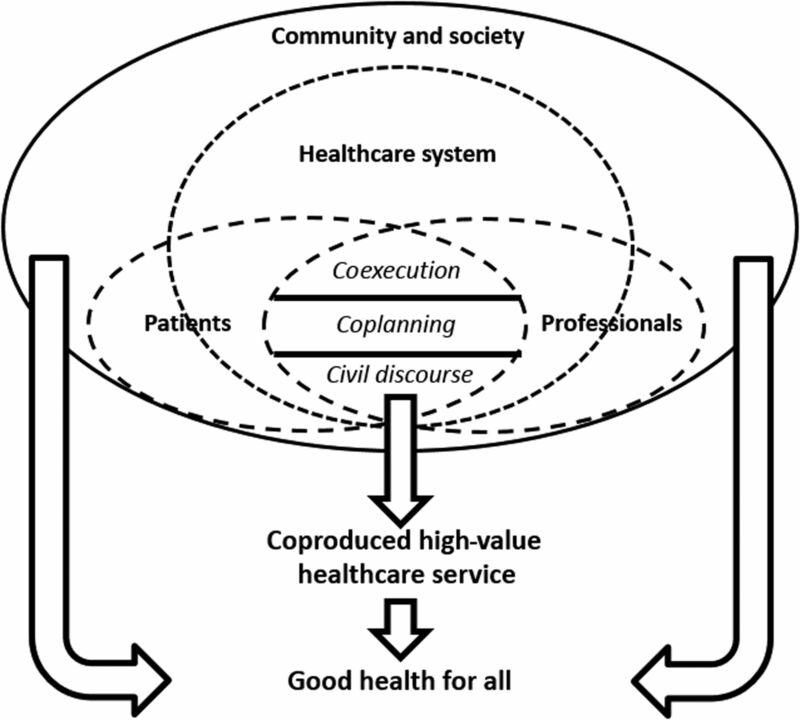 Conceptual model of healthcare service coproduction. The concentric circles around the interactions between patients and professionals suggest that these partnerships are supported and constrained by the structure and function of the healthcare system and by the large-scale social forces and other social services at work in the wider community. 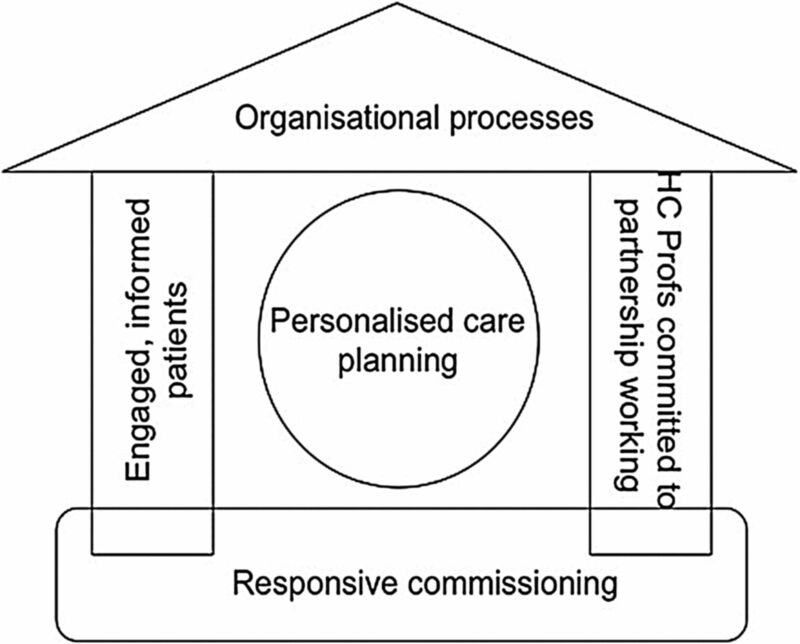 As participants within the healthcare system and the community, the public (noted in the diagram as patients) and healthcare professionals also have agency to shape the system. Patients and professionals are not contained within the healthcare system, suggesting the myriad ways in which people may interact with individuals and organisations outside of the healthcare system to affect both health and healthcare service outcomes. The arrows illustrate that coproduced healthcare service contributes to the broader aim of good health for all, which is a consequence of many social forces and sources of caring. We use the plural form of both ‘patients’ and ‘professionals’ to signal the importance of relationships within and between groups of patients and professionals. The dashed lines suggest that this coproductive lens blurs roles for patients and professionals and blurs the boundaries of the healthcare system within the larger community. Within the space of interaction between patients and professionals, the model explicitly recognises different levels of cocreative relationship. At the most basic level, good service coproduction requires civil discourse with respectful interaction and effective communication. Shared planning invites a deeper understanding of one another's expertise and values. Shared execution demands deeper trust, more cultivation of shared goals and more mutuality in responsibility and accountability for performance. Each level of shared work requires specific subject matter knowledge, know-how, dispositions and behaviours. Three cases drawn from the authors’ own personal experiences—a National Health Service (NHS) campaign, a clinic's experience with shared medical appointments and a facilitated network of patients with chronic disease—illustrate key features of the model's implications and limitations. Our central tenet is that healthcare services are always coproduced by patients and professionals in systems that support and constrain effective partnership. We do not improve healthcare services by adding coproduction. Rather, as we come to recognise this essential coproductive character of healthcare services, we see new opportunities for innovation and improvement. Our first case example is an educational initiative intended to help patients and health professionals develop the necessary competencies and dispositions for effective partnership. The Health Foundation's Co-Creating Health Initiative promoted self-management in the NHS.47 Patients and professionals in England and Scotland were trained to facilitate patient self-management of chronic pain, diabetes, depression and chronic obstructive pulmonary disease. The programme sought to move healthcare services from ‘relieving’ patients’ problems to ‘enabling’ patients to address their own concerns. Building on Lorig et al,41 the health professional who does to and for patients becomes a coach collaborating with patients, as they find their own best way to wellbeing. Clinical conversations shift from an illness model focused on patient problems to an asset model focused on patient strengths. Our second case example illustrates a healthcare system design innovation that has the potential to support effective partnership between patients and health professionals. Shared medical appointments (‘group visits’) have been employed to expand access, decrease utilisation, improve outcomes, increase patient satisfaction and grow patient capacity for self-care.50–52 Designs vary, but group visits typically engage 8–15 patients for 90–120 min in a group educational session and a brief, billed individual provider visit. At a Cambridge Health Alliance affiliated clinic in Massachusetts, three groups of patients with diabetes (averaging about 10 patients per group) were convened. Groups met for 2 h monthly with an interprofessional healthcare team. The appointment included a meal (supported by an external grant), one-on-one clinical encounters with a medical resident and a group session with learning and conversation. Trainees and patients were invited as design partners; regular participant feedback and evaluation led to ongoing improvement. Our third case example illustrates a more disruptive healthcare system innovation in which patients and health professionals engage more fully as coproductive partners in healthcare service and create new structures for shared activity that reach beyond the boundaries of the clinic. ImproveCareNow is a network of patients, families, clinicians, and researchers for improving the health, care, service and costs experienced by children and adolescents with inflammatory bowel disease (IBD). The 71-site network serves more than one-third of US children and adolescents with IBD and has increased the clinical remission rate for patients from 60% to 79%. With the Collaborative Chronic Care Network, ImproveCareNow has developed the social, scientific, and technological infrastructure to alter how patients, parents, clinicians and researchers engage the healthcare system. A formal design process identified changes that shifted a hierarchical, provider-driven network to one in which all stakeholders work as partners in improving individual health, clinic healthcare service and network operations. Three core elements enable this coproduced learning network: (1) clear and consistently articulated shared purpose (to improve disease remission rates) and values (to promote all network members as equal partners), (2) readily available resources to make participation easier for all and (3) processes and technology to support collaboration and knowledge sharing. Participating centres share outcome data transparently; the network showcases healthcare centre and stakeholder successes and provides a variety of technologies and venues for sharing personal narratives. Patients, families and professionals have worked together to develop tools that enable coexecution of good healthcare service: electronic previsit planning templates and population management algorithms; self-management support handbooks and shared decision-making tools; parent disease management binders; adolescent transition materials; handbooks for newly diagnosed families and a mobile app to track symptoms, plan a visit or test ideas about how to improve symptoms. Organised, representative leadership of patients, families and multidisciplinary healthcare professionals govern the network. Resource and information cocreation strengthens the model. Patients, parents and research teams routinely collaborate. As a young adult patient and former chair of the ImproveCareNow Patient Advisory Council describes: We are doing research…in a way that allows patients to actually participate not just in the data collection, but in [determining] the questions that are asked of the data, and even producing the results. Parents and providers plan and coteach modules at network-wide learning sessions. The following email exchange between a network physician and parent while planning a plenary address illustrates the fundamental shift towards shared work. Physician: What do you guys [parents] want me to do here? Or should I wait to comment when you guys [parents] all have a chance to solidify your take home message? Please tell me how to be helpful to you. Parent: I’m struck by how fantastic it is that you even asked the question and framed it like you did! Serious kudos! This has to be a perfect example to the network of coproduction between physicians and parents. A network quality improvement coach reflects on the shared value-creating system: I used to believe…[patients and families] were partners, but also customers and [ImproveCareNow staff] had to make it all work well for them. I now realize it's all about working with them so they can help us get things right. Today these patient and parent partners email me just as any of my other coworkers. They do so despite having busy full-time jobs inside or outside of their homes and despite the extra time they already devote to caring for children with a chronic illness. They share their ideas, ask for my input, worry about pushing us too fast, … worry about not pushing us fast enough, and ask how my kids are doing. Most of all, they are helping us walk together into a new model for running this Network, understanding we won't get it right every time, caring about the impact on others who are new to this level of partnership too, and above all, making sure we all stay connected to what this work is really about. As a culture of cocreation and generosity grows, productive relationships form more naturally, and individuals—clinicians, parents and patients alike—seem to gain energy to do even more meaningful work together. The same three cases illustrate limits and challenges to the application of this framework. Not all patients have the desire or capacity to be active participants in coproducing their healthcare service. Sometimes patients are sick, and need a health professional to relieve a burden rather than enable self-care. In the emergency department, the operating room and the intensive care unit, professionals and patients necessarily employ Normann's relieving logic in greater measure. The character of the partnership between professionals and patients is dynamic and degrees of agency shift across time and setting and circumstance. People from every background and social location become patients with widely disparate coproduction dispositions and capacities. At the Scottish site described above, not all patients elect to participate in training. Even after completing training, patients are differently willing and able to embrace a more active partnership with their clinicians. Patients who accept the invitation to engage in group visits and prioritise ongoing attendance are a small subset of the Cambridge clinic's patient population. Many ImproveCareNow participants remain unaware of how the Network drives improvements in their own care and do not recognise (or take) the opportunity to become involved. Clinicians and care teams do not always recognise families ready to take a more active role. Scheduling meetings and right-sizing commitments of time and energy for patients and families remain challenging. While many might welcome the opportunity to engage as interlocutors with their healthcare service professionals at the level of civil discourse, the idea of mutual accountability for outcomes is controversial.43 It is neither possible nor desirable to share power and responsibility equitably between patients and professionals in all situations. The burden of responsibility for medical and surgical error, for example, must fall disproportionately on healthcare professionals. When patients make unhealthy choices, health professionals must continue to engage and the healthcare service system must continue to function as a safety net. The healthcare system cannot abandon patients who do not have the resources or expertise to partner effectively in coproducing good health outcomes for themselves. The model may appear to diminish the value of professional expertise by transferring care responsibility to patients and families. Sorting helpful from available information is complex; requiring too much patient autonomy can result in bad health outcomes.53 Clinician partners in the ImproveCareNow network sometimes articulate this fear. As professionals share agenda setting in interactive group visits in the Cambridge clinic, the conversations sometimes seem (to health professionals) to be steering ‘off course’. Shared navigation is not always easy. Coproducing healthcare service challenges standardisation. Reducing unnecessary, unintended variation in healthcare service has improved quality and safety in many meaningful ways. The coproduction lens invites increasing attention to necessary adaptation and asks healthcare professionals to let patient and family priorities dominate in driving ‘intended’ variation in healthcare service. Easing the isolation of living with diabetes may be more important this year to one group participant's wellbeing than completing a timely eye examination. Publicly reported performance on quality metrics may not immediately reflect group visit work. Shared values and alignment of patients and professionals allow all ImproveCareNow network members to join in the shared aim of increasing IBD remission rates, even as individuals pursue different paths towards the goal. Noticing the cocreative dynamics of healthcare service invites a pause in what sometimes seems an inexorable march towards standardisation of healthcare professional work. Greater discernment between necessary and unnecessary variation will be key. Engaging professionals and patients as coproductive partners is difficult and time consuming. Years after introducing the construct of shared decision making, principles are rarely employed in patient–clinician encounters.54 Even after training, many patients and professionals in Scotland inconsistently apply new-found skills and orientation. Conversations revert easily to professional-centric priorities and professionals slip into providing healthcare service as a product—a quantum of advice, a package of evaluation and management. When productivity pressures increase, professionals migrate towards ‘what's-the-matter-with-you medicine’ and away from ‘what-matters-to-you medicine.’55 It is difficult for the NHS to calculate the long-term return on investment in evaluating these paradigm-shifting trainings. In our efforts to improve healthcare service, we have often inadvertently approached the work as though healthcare was a ‘good’ produced by healthcare professionals. Recognising that healthcare service is a ‘service’ coproduced by patients and health professionals invites four clusters of opportunity for action. Cocreating healthcare service well requires new skills, new knowledge and new dispositions for health professionals and for patients. The NHS-sponsored workshops highlight one model for learning. What other models for health professional formation and public education will be effective in recalibrating expectations and developing and sustaining new habits? The design of the healthcare delivery system—at the level of the clinical microsystem and beyond—has the power to help or hinder effective coproductive relationships. Shared medical appointments highlight one delivery system innovation. In what other ways might the healthcare delivery system evolve to facilitate cocreative relationships between patients and healthcare professionals? How might efforts to invite better partnership between patients and professionals harness the energy of new information technologies? What will encourage effective codesign? How will newly designed systems be held accountable? What changes will be necessary in healthcare regulation and finance to support these models? Current healthcare service system boundaries are limited by a professional-knows-best mindset, which can be blind to the powerful actions and forces that shape health outside of the boundaries of the healthcare system. Transcending those limits unleashes new resources, as evidenced by ImproveCareNow. Other disruptive models will emerge. What new partnerships will emerge? Will coproduction help decrease total medical expense? How will cost savings be distributed? What values will drive these new systems of service?56 How will the hazards of new options be recognised, prevented? Though the science of patient-centred outcomes is growing, health professionals and payers have historically defined their own metrics for success.57–62 Evidence-based guidelines have sometimes been applied as product specifications and adherence to these specifications has been measured to reward and punish healthcare professionals as producers. Measures that accurately reflect coproduced service and its results will need to supplant product paradigm metrics. Which measures will help us understand coproductive processes? What outcome measures will accurately reflect the diversity of ‘what matters to you’ when you are the patient? How will we know that change is an improvement? Healthcare is not a product manufactured by the healthcare system, but rather a service, which is cocreated by healthcare professionals in relationship with one another and with people seeking help to restore or maintain health for themselves and their families. This coproductive partnership is facilitated or hindered by many forces operating at the level of the healthcare system and the wider community. This frame has implications for understanding the aim of healthcare service and the potential roles and responsibilities of all participants. Improving healthcare service using this construct invites us to consider new ways of preparing health professionals and socialising patients, new organisational forms and structures for healthcare service delivery, and new metrics for measuring success. Like any paradigm, the construct of coproduced healthcare service is imperfect and contains its own pragmatic challenges and moral hazards, but these limitations do not negate its utility. Marcel Proust suggested that the real voyage of discovery consists not in seeking new landscapes, but in having new eyes.63 Perhaps this lens of coproduction will help us see healthcare service with new eyes. Hippocrates. The Genuine Works of Hippocrates. Trans. Francis Adams. Vol 2. London, UK: Sydenham Society, 1849:697.
. The service economy. New York, NY: National Bureau of Economic Research, 1968.
. Models for indicator development: a framework for policy analysis. Washington DC: Urban Institute, 1976:1206–17.
. The third wave: the classic study of tomorrow. New York, NY: Bantam, 1980.
. Reframing business: when the map changes the landscape. Chichester, UK: Wiley, 2001.
. A toolbox for co-production of knowledge and improved land use dialogues: the perspective of reindeer husbandry [PhD Thesis]. Umeå, Sweden: Department of Forest Resource Management, Swedish University of Agricultural Sciences, 2015:20.
. Enhancing adaptive capacity through co-production of knowledge in New Zealand. Proceedings of the Resilient Cities 2014 congress; 5th Global Forum on Urban Resilience and Adaptation; Bonn, Germany, 29–31 May, 2014.
. Engaging public sector clients: from service-delivery to co-production. New York: Palgrave Macmillan, 2009.
. In search of a new logic for marketing: foundations of contemporary theory. West Sussex, UK: Wiley, 2008.
, eds. Co-production of health and wellbeing in Scotland. Birmingham, UK: Governance International, 2013.
. Co-producing care. In: Sorensen R, Iedema R, eds. Managing clinical processes in health services. Sydney: Mosby, 2008:105–20.
. Co-creating in health practice. London, UK: Radcliffe, 2014.
. What is already known about involving users in service transformation. In: Greenhalgh T, Humphrey C, Woodard F, eds. User involvement in health care. Chichester, UK: Wiley-Blackwell, 2011: chapter 2:10–27.
. Bringing user experience to health care improvement: the concepts, methods and practices of experience-based design. Oxford: Radcliffe Publishing, 2007.
. A rapid synthesis of the evidence on interventions supporting self-management for people with long-term conditions: PRISMS—Practical systematic Review of Self-Management Support for long-term conditions. Southampton (UK): NIHR Journals Library; (Health Services and Delivery Research, No. 2.53. ), 2014.
. Delivering better services for people with long-term conditions: building the house of care. London, UK: Kings Fund, 2013.
. Chronic disease management: what will it take to improve care for chronic illness? Eff Clin Pract 1998;1:2–4.
. Sustaining and spreading self-management support. Lessons from co-creating health phase 2. London, UK: Health Foundation, 2013.
http://personcentredcare.health.org.uk/resources/development-of-e-learning-module-clinicians/ (accessed 11 Dec 2014).
. Co-creating Health: evaluation of first phase. London, UK: Health Foundation, 2012.
. Shared medical appointments for chronic medical conditions: a systematic review. Evidence-based synthesis program. Washington DC: Department of Veterans Affairs, 2012.
. Systems of service: reflections on the moral foundations of improvement. BMJ Qual Saf 2011;20(Suppl 1):i5ei10. Marcel Proust. BrainyQuote.com, Xplore Inc, 2015. http://www.brainyquote.com/quotes/quotes/m/marcelprou107111.html (accessed 26 Jul 2015). Contributors The seven-member writing group convened approximately 12 times to develop the intellectual content of the article. The group responded collectively to several written drafts of the paper and radically revised the substance of the article through conversation. The intellectual genesis of the article was provided by PB, who convened the writing group. Most of the text of the article was written principally by MB, who is identified as the first author. MS, PM and LO-A are leaders in the Cincinnati Children's Hospital and Medical Center-based ImproveCareNow network and prepared the text that describes their experience with that initiative. Hans Hartung has been an active participant in the Health Foundation's Co-Creating Health Initiative and prepared the text that describes his experience with that initiative. GA was an integral member of the writing group who provided a critical nursing perspective on the construct of health coproduction. Funding National Institutes of Health (NIH NIDDK R01DK085719), Health Foundation, Arnold P Gold Foundation. Ethics approval Cincinnati Children's Hospital Medical Center. Data sharing statement This is not an empirical study, but rather a conceptual paper of grounded theory that engages three case studies as exemplars. Additional data regarding the Co-Creating Health Initiative sponsored by the Health Foundation is available from the Health Foundation. Additional data regarding the ImproveCareNow network is available through Cincinnati Children's Hospital and Medical Center.